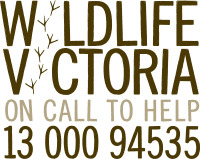 Wildlife Victoria provides a vital link for the community between distressed Australian wildlife and the appropriate response and care needed. We utilise our technology, experience and knowledge, together with positive collaborations to advocate for better wildlife welfare and educate the community about how to successfully co-exist with these iconic creatures. Our emergency response service operates 365 days of the year, calling upon our dedicated network of volunteer rescuers, transporters and carers.